Welcome everyone to the “Gaming News from Neoscream” post. This is my weekly gaming news post for miniature games, RPGs and some card games, as well as my miniatures painting and upcoming local events. Due to going to London next Friday to see Foxes at the Round House and work on Saturday, next week’s post will ever be on the Thursday or on the Sunday or there will not be a post next week. Hopefully it will be on Thursday, but I am not placing any bets, but if there is no post I might post the Build Analysis post for my Genesis deck for Cardfight Vanguard an week earlier as most of it is written. First off we have the Bushiroad news. 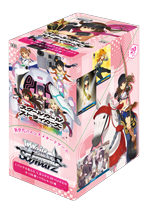 With Weiß Schwarz, today sees the release of NISEMONOGATARI Booster set, Trial Deck and Meister Set in English and the School Girl Strikers Booster set in Japanese. Next is the HeroClix news. 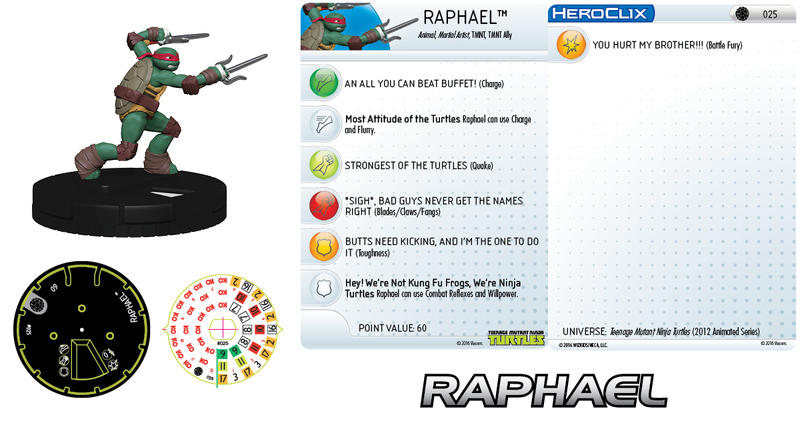 This week we got previews of: Two versions of Raphael from Teenage Mutant Ninja Turtles. 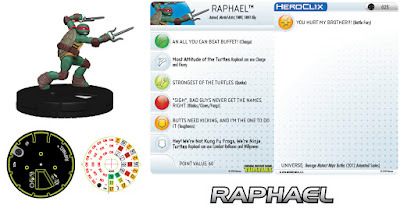 Yes that is right the HeroClix set for Teenage Mutant Ninja Turtles is still coming. Now for the Mantic news. Since last week’s post The Walking Dead All Out War KickStarter has managed to unlock: Four Abandoned Car; two more Prison Walkers, Walker Duane and eight Equipment cards were added to the Prison Expansion; the characters Maggie, Julie, Chris, Arnold, Laien, Craig and Carlos; the characters Rick in Riot Gear, Morgan, Billy and Ben was added to the Prison Expansion; two Farm Walkers; one more Walker; four more Equipment cards; and the KickStarter exclusive character Abraham. The stretch goals that are still going as I post this are: The character Michonne (with her Walkers) will be added to the Prison Expansion. The KickStarter will be finishing week so let us see what they can unlock between now and then. Also on Warpath side of Mantic, the beta rules for the Firefight version of the game is available to download. Next is the IDW games "Teenage Mutant Ninja Turtles: Shadows of the Past" KickStarter news. The KickStarter has ended last night and they managed to make $862,211 with 6,033 backers. Since the last post they have managed to unlock: KickStarter exclusive Sheamus Rocksteady was added to The Works pledge level; KickStarter exclusive Mirage -mission- campaign, KickStarter exclusive Roof Top map and a KickStarter exclusive ally card for Fugitoid was added to both pledge levels; another Eastman Lithograph and a portfolio case was added to The Works pledge level; eight KickStarter exclusive villain custom dice were added to both pledge levels; a KickStarter exclusive villain sheet of Shredder was added to The Works pledge level; and KickStarter exclusive human versions of Bebop and Rocksteady was added to The Works pledge level; a KickStarter exclusive sculpt of Shredder was added to The Works pledge level; and the Ally card Angel Bridge. With Angel Bridge, they have not made it clear (unless it was in the comments) if she is a KickStarter exclusive or not and what she is being added to (the cord game, both Pledge levels or just The Works pledge level). They have managed to unlock everything. Now for the Kingdom Death news. If you did not see the update post I did during the ladt weekend, wave three of Kingdom Death Monster has started shipping. Wave three was meant to contain all of the expansions, however due to problems the Lantern Festival expansion will be shipping on its own as a fourth wave. During the week people who have received their's have been posting previews and they are looking awesome. Oh and the Green Armour set is so very over powered. Next is the Privateer Press news. They have joined the KickStarter bandwagon again. This time for the Hordes version of "The Undercity", called "Widower's Wood". This includes an expansion for it too. There are three pledge levels. "Widower's Wood Game Plus" which is the game and stretch goals that are linked to that level. "Widower's Wood Deluxe Edition" comes with the core game, the expansions Dead Men Walking and all appropriate Stretch goals. And then "Widower's Wood Premium Collectors Edition" comes with the core game, the expansion, Q-Workshop dice, a deluxe wooden box to store ALL the stuff you get and all appropriate Stretch goals. As I post this they have managed to unlock: The game was funded; the KickStarer exclusives Viktor Pendrake and a mission was added to all pledge levels; the KickStarer exclusives Crede, Jagger and Lanyssa Ryssyl was added to both the Deluxe and Premium levels; four more Swamp Shamblers, two Swamp Gobbers, sixteen alternate autumn themed tiles and four more Side Quest cards were added to all pledge levels; and a Boss Club Gatorman was added to both the Deluxe and Premium pledge levels. As I post this the stretch goals that are still going were: A KickStarter exclusive Ironback Soitter will be added to both the Deluxe and Premium pledge levels at £225k (almost done); a Boss Spear Bog Trog will be added to both the Deluxe and Premium pledge levels at $237k; four more Small Tatzylwurms will be added to all pledge levels at $250k; a Boss Swamp Gobber will be added to both the Deluxe and Premium pledge levels at $262k; four more Club Gatormen and a KickStarter exclusive mission will be added to all pledge levels at $245k; a Boss Small Tatzylurm will be added to both the Deluxe and Premium pledge levels at $287k; six Tomahawk Gatormen will be added to both the Deluxe and Premium pledge levels at $300k; a Boss Gatorman Bokor will be added to both the Deluxe and Premium pledge levels at $312k; ever six more Spear Bog Trogs or two more Gatormen Bokor (voted by backers) will be added to all pledge levels at $325k; ever a KickStarter exclusive Blackhide Wrastler or a KickStarter exclusive Swamp Horror at $350k. Now for the Modiphius news. Well this is not really news, more like a statement. Like normal with ANY role play KickStarter I have backed, wave one of the Infinity RPG is running late. They are still working on the core rule book and the other books of wave one, the physical copies of them should have/be shipping this month. I have a strong feeling that wave one will be more like April/May time. Let us just hope that it will not be as bad as Mekton, which the PDF copy of the main rule book was meant to ship in December 2013 and we are STILL waiting for it. Next is the Cool Mini or Not news. 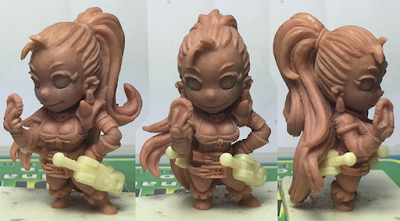 On the Arcadia Quest Inferno KickStarter they have posted the fourth part of making Sarya. Lastly on other gaming news Nintendo have revealed that in the holiday period of 2016 they will be releasing the next generation of Pokemon games. Pokemon Moon and Pokemon Sun. Oh and Pokemon celebrates 20 years today. Wave four of Kingdom Death Monster (December 2013), wave two of “Journey Wrath of Daemons” (July 2014), “Mekton Zero” (digital December 2013, physical March 2014), “Paranoia” (June 2015), wave two of “Shadows of Brimstone” (August 2014), “Zero Agents” (December 2015) and wave two of “Robotech RPG Tactics” (December 2013) have all been delay due to problems and currently have no dates on when these will start shipping. Wave three of “Kingdom Death Monster” (December 2013), “Dragon Tide” (September 2015), "Mechabrick” (April 2014), “Slaughterball” (June 2015) and "Dwarven Forge's City Builder Terrain System” are all currently shipping. "The Walking Dead: All Out War" KickStarter should be finishing on the 29th of February 2016. "Malaphias" KickStarter should be starting by the end of February 2016. Wave one of the “Infinity RPG” (February 2016), “Yashima: Legend of the Kami Master” (July 2015), “Deadzone Infestation” (January 2016), wave two of “Thunderbirds Co-operative Board Game” (December 2015)"Mechabrick Upgraded" and "Warbears and Stagriders, Fantasy Wargames Miniatures" should ship in March 2016. "The Others: 7 Sins" (March 2016) should ship in April 2016. “Halfling Adventurers Miniatures” (January 2016) should be shipping in late April to May. Wave one of the “Conan” board game (February 2016), “Myth Journeyman”, "Dropfleet Commander", "Arcadia Quest Inferno" and wave two of "Zombicide Black Plague" (December 2015) should ship in June 2016. “Demigods Rising” (July 2015), wave two of the “Infinity RPG”, “Battle System’s Urban Post Apocalypse Terrain” and "Teenage Mutant Ninja Turtles: Shadows of the Past" should ship in July 2016. Wave one of "The Walking Dead All Out War" should be shipping in August 2016. Wave two of the “Conan” board game should ship between July and September 2016. “Warpath” should ship in September 2016. Wave three of the “Infinity RPG” should ship in October 2016. “Super Dungeon Explore: Legends” should ship in December 2016. These are local gaming events in Milton Keynes I know of, Guardians of Tyr events at Wargames Workshop Northampton and other events I plan on going to or want to advertise. Every Monday (except Bank Holidays) night at Wargames Workshop MK is there Wargames and Boardgamers night. Every Thursday night Milton Keynes Wargames Society holds a gaming night at York House in Stony Stratford. On Sunday the 6th of March 2016, Guardians of Tyr will be running a Star Wars X-Wing tournament at Wargames Workshop MK. However it is sold out. On Saturday the 6th of March 2016, there will be a Weiß Schwarz Tournament at Wargames Workshop MK. Please check the "CFVanguard and WeißSchwarz M.K." Facebook group for details. On Monday the 7th of March 2016, will be the second part of the Frostgrave campaign being played at Wargames Workshop MK. We will be meeting up once a month on the first Monday of the month for ten months. For details please check the "Frostgrave: The Beginning" Facebook group. On Saturday the 12th of March 2016, there will be a Cardfight Vanguard Tournament at Wargames Workshop MK. Please check the "CFVanguard and WeißSchwarz M.K." Facebook group for details. On Sunday 13th of March 2016, Guardians of Tyr will be running a Steam Roller Warmachine/Hordes tournament at Wargames Workshop Northampton. On Saturday the 19th of March 2016, Guardians of Tyr will be running a Game of Thrones The Card Game tournament at Wargames Workshop Northampton. On Saturday the 20th of March 2016, there will be a Weiß Schwarz Tournament at Wargames Workshop MK. Please check the "CFVanguard and WeißSchwarz M.K." Facebook group for details. On Saturday the 26th of March 2016, there will be a Cardfight Vanguard Tournament at Wargames Workshop MK. Please check the "CFVanguard and WeißSchwarz M.K." Facebook group for details. On Saturday the 2nd of April 2016, Guardians of Tyr will be running a Warhammer 40,000 Conquest tournament at Wargames Workshop Northampton and a Steam Roller Warmachine/Hordes tournament at Wargames Workshop MK. On Saturday 16th of April, Salute will be happening at the ExCel London. This year's theme is Steam Punk. Wargames Workshop MK has a £2 gaming fee or £4 with a £3.50 booster pack (Magic/Yu-Gi-Oh) unless it is a paid tournament run by Guardians of Tyr. Weekday events normally start at 6/7PM. For rules for Guardians of Tyr tournaments and leagues as well as information on pre booking your place in tournament. Pre booking is highly recommended so they know how many people are coming. So please go to their website which there is a link to it under my links section which are located on the right hand side of this blog. York House has a £3 on the day gaming fee (unless you are a child or unemployed where it is £1) and a £5 fee for a year’s membership. However the first day is free and they only take yearly membership fee at the start of the year. The hall officially opens at 7PM, but normally people start arrived 15 to 30 minutes early. Until next time, enjoy life.